OK, not really, but DC is breaking up the marriage of its most iconic couple. The recently-announced DC Universe reboot has met with a mixture of criticism, disbelief, and controversy. Many of the problems that fans have had with the decision is over what the editorial overlords at DC are keeping as part of the canon storyline and what they're planning to axe. However, this latest reveal is surely going to anger a lot of comic readers: DC has all but officially confirmed that it'll be doing away with the marriage between Clark Kent and Lois Lane. Speaking to NBC New York's PopcornBiz blog, DC Comics Co-Publisher Dan DiDio spoke about the future of Clark and Lois as a married couple. "Let's just say it's being reexamined," he said. "Because it's something that I think is something that is so valuable to the character's story that you really want to explore all facets of it. Not just as it exists currently." 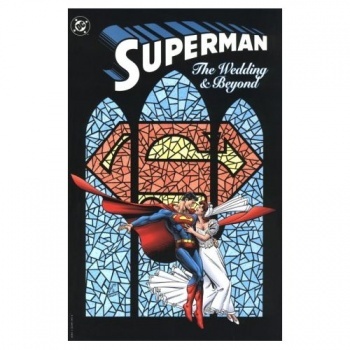 Superman and Ms. Lane were married in 1996, and it's been one of the longest-lasting story events in DC's continuity (it even coincided with the episode when the same characters were married on ABC's show Lois & Clark: The New Adventures of Superman. However, the new relaunch of Action Comics by Grant Morrison and Rags Morales is apparently going to begin "a new chapter" for Superman and will "refresh some ideas that have maybe become so well known that people think they've got it all figured out." Apparently one of those well-known ideas is how Superman got married to the woman he loved from afar for over fifty years. I never had a problem with Superman being married to Lois, and I'm not entirely sure that this part of his past needs to be retconned. On top of that, this is also a really brave (or stupid, depending on how you look at it) move for DC, since Marvel did the exact same thing with Spider-Man and Mary Jane Watson in 2008 with its "One More Day" storyline; fans and critics still haven't forgiven the comic publisher for that decision. Rumor has it that the marriage is being dissolved so Superman can start getting some super-powered love from Wonder Woman. If that's the case, I'm sure I'm not the only one whose mind went to a bad place when I thought about the Amazon Princess using her lasso on the Man of Steel.